The Castelgarden XS55BVWE4 lawnmower is designed for medium to large sized gardens. 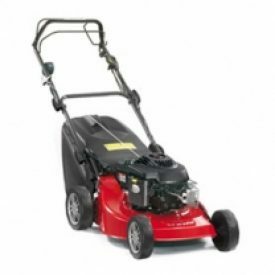 It is powered by a Briggs & Stratton 775 IS INSTANT START PUSH BUTTON START engine which eliminates the need to manually prime or choke the engine. This feature, , makes this model ideal for anyone who finds the pull-start system difficult. Its self-propelled variable speed transmission allows for maximum control with minimum effort. Equipped with a 53CM GALVANISED 4in 1 discharge system deck it features a single lever centralised height adjustment system which boasts a cutting height range from 25mm to 80mm. It also contains a deck wash facility, ensuring that keepin g the deck clean couldn’t be simpler; just attach a hose to the snap-on connector and the rotating blades disperse the water around the deck. The Castelgarden xs55 bvwe4 lawnmower is also an extremely versatile machine as it offers a 4 in 1 system for cutting your grass. Firstly, it comes with a rear discharge system which simply allows the grass to fall to the ground when cut. Secondly, its collection facility features an impressive grassbag capacity of 70 litres. Finally, it also offers the added facility of recycling your grass through the use of its mulching kit. Mulching is generally regarded as the most efficient and effective method of cutting your grass. It cuts and recuts the grass into tiny pieces. These, in turn, simply wilt away returning vital nutrients to the soil thus encouraging beautiful, green growth. Centralised height adjustment system allowing you to raise the level of the deck up and down with one lever. This is an ideal feature for anyone who finds the pull-start system difficult. Its self-propelled transmission allows for maximum control with minimum effort.